In a heavy-based pan, sauté onion, garlic and chill in olive oil over a medium heat until soft and translucent. Add sparkling white wine, simmer and reduce liquid by 1/3. Add mussels and cover until mussels begin to open, approximately 6-8 minutes. Once cooked, break butter into teaspoon-sized pieces and scatter over mussels. Add chopped parsley and stir through. Taste sauce and adjust seasoning if necessary. 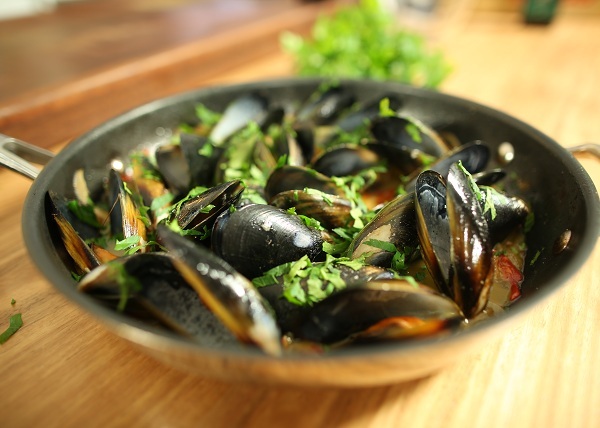 **Added salt should not be required due to the natural salt content of the mussels. Serve straight to the table with crusty bread on the side.